On the Kola Peninsula the presence of Catholics dates back to the beginning of the construction of commercial and military port and the city of Murmansk. In this area lived only the local population, living by fishing, hunting and collecting fruits of plants, growing abundantly in the tundra, and specialists and workers for the grandiose construction was necessary to bring other areas. This problem was solved largely exiled. These were people of different nationalities. Poles, Belarusians, Lithuanians, Ukrainians and others, many of whom were Catholics. When the city began to develop here we have sought to work with people throughout the Soviet Union. Thus, in Murmansk and the Murmansk region inhabited by people of different nationalities, different religion. At the beginning of 1916 the rector of the Catholic community of Petrozavodsk has asked permission from the Administration to build a Catholic chapel in Murmansk for about 400 Catholics (workers, engineers and soldiers), building the city, port and railway. However, the revolution prevented those plans. Parish of St. Michael the Archangel operates in Murmansk since June 18, 1991, however, its activities were very limited – about once a year visited our town priest from St. Petersburg, spent Mass, baptize children. The parishioners are people of different nationalities, mostly newcomers and descendants of the first builders of the railway, the port and the city, most of them are elderly people whose well-being can not be called high. The number of parishioners increased and now stands at about 300 people (grandmothers bring their grandchildren, many Catholics know about the existence of accidental arrival of friends, etc.). Believers have repeatedly appealed to Archbishop Tadeusz Kondrusiewicz in Moscow with a request to send in Murmansk priest who would reside here permanently, conduct worship services and all the rites as it relies in the Catholic Church. As a result, April 17, 2000, Archbishop entrusted the work of the parish. Juan Emilio Sarmiento and appointed him rector. Since the arrival in Murmansk operates continuously. Yearly passes re-registration in the Ministry of Justice and as it should be in a timely manner all reports rents under taxes and payments to social funds. Due to the absence of the temple (chapel) all rites, sacraments and liturgy held in unsuitable places for these purposes: apartments, rented premises. Currently, rector of. Juan E.Sarmiento lives in an apartment that is owned by the parish. Back in 2001, the parish at the request of the parishioners, the number of which is increasing, appealed to the City Administration with a request to allocate land for the construction of the temple. After years of procrastination, we defined the place for the construction (Resolution of the Administration of Murmansk on 11.11.2004. № 958), and the Department of Architecture given architectural and planning task number 304 of 18.11.2004g. Almost two years spent on the development and coordination of the project of the future church, and only in 2006 the parish was able to announce a tender for the construction. An analysis of the proposals received (from Murmansk firms and one firm from St. Petersburg) and numerous consultations chose the company “Murmanskpromstroy”, which 19.06.2006g. the contract was made and the construction of the temple began. November 11, 2007. the ceremony of consecration of the completed construction of the temple. At the celebration of consecration was attended by Nuncio Antonio Mennini, and about 20 priests. However, the parish still has not received the approval of the competent authorities to enter the temple in operation. The cause is an unreasonable demand of the Contractor a significant increase in the cost of construction and failure throughout the parish executive technical documentation required for entry into service of the temple. In this regard, the parish was forced to appeal to the Court of Arbitration of reclaiming all the documentation. The contractor, in turn, filed a lawsuit on the recognition of the transaction invalid. Cases will be considered 26.05.09. and 28.05.09. The temple is very necessary to our congregation, many of whom come to the Sunday service of Apatity, Nickel, Monchegorsk, Kandalaksha, Severomorsk and other settlements of the Murmansk region. 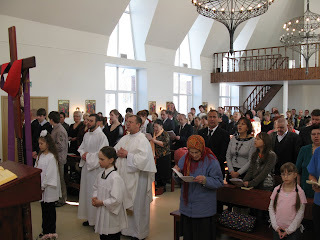 The presence of the Catholic Church in the city of Murmansk will provide an opportunity to learn about many Catholics joining activities and thereby participate in the holy sacraments in conditions befitting worship. It will also facilitate their participation in the life of the parish, will serve the development of trust and goodwill towards others, will provide an opportunity to improve the work of educating young people and children in the spirit of Christianity. It is the only Catholic church in the Kola Peninsula, was built thanks to the efforts and assistance of the Missionary Congregation of the “Sons of the Immaculate Heart of the Blessed Virgin Mary” (Missionaries Claretians) and this fact imposes on priests and parishioners additional responsibility. Catholic Church should serve as an example in all things, and especially in the behavior of parishioners and interested people: goodwill, cooperation with other denominations, the bearing of helping the needy, caring for the people around us and the nature and more. Achieving these goals is the main task of the Roman Catholic Church and the presence of the current church in Murmansk will serve exactly this. · Rector performs in the church, the hospital and as required elsewhere in all the sacraments, worship and ceremonies, namely, Sunday and daily Mass, baptism, first communion, anointing the sick, etc. Worship in the temple are performed with oral permission from the head of the Administration of Pervomaisky district of Murmansk. · 2 times a month on Saturdays rector conducts the service in the town of Apatity, which gather the faithful not only to the city of Apatity and near lying cities and towns. From 2003 to the present parish is on the line “Caritas” charity program “Social care for children – free breakfast.” This program aims to help children from poor and disadvantaged families – 80 high school students number 23 in the city of Murmansk. · Expansion of charitable activities of the parish.